Storytelling through media. We all have stories, our families, our background, experiences and cultures. There is a chance to share and to learn from each other. There is no limit in age to explore and create. My approach is to help stories to grow and connect. I am offering courses for children, youth and adults in different media helping to bring stories to life. Media educational projects. I offer courses and projects with children, youth and adults. Please see my courses below. 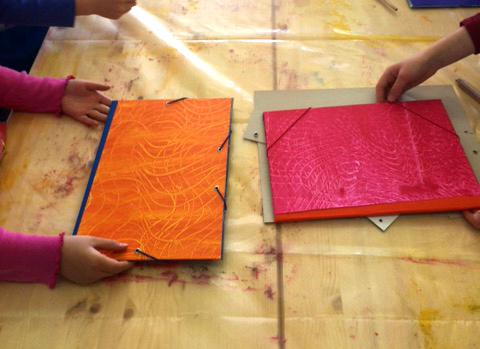 Experimental Art Books - Creating book and paper projects. Learn techniques and how to tell stories with a folded paper. Paper Theatre - Creating a theatre with small paper objects and learn to play with light and paper puppets. Paper Stop-Motion Animation - Creating a paper stop-motion with simple materials and watch the story at the end digitally. Audio Play Production - Producing a short audio play with sounds, voice and music. Sketching and Printmaking - Drawing and printing with different techniques telling a story or creating a graphic novel. Digital Storytelling - Creating a video story with photos, video or sound pieces to tell a story about your life or fictional ideas. Previously, I have worked with different groups and on different media projects such as the Youth Gathering House Roßbach in Naumburg, Germany (teaching audio play production or theatre), or with the Banff Elementary School in Canada (teaching shadow play theatre).